This care sheet is intended only to cover the general care of this species. Continued research in order to best develop a maintenance plan for whichever species you are caring for is essential. 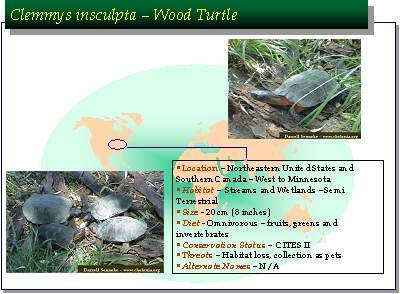 Wetlands and the woods and fields that surround them in the Northeast and North-central United States as well as Southeast and South-central Canada are host to Glyptemys insculpta – the Wood Turtle. For some turtle hobbyist s, herpetoculturists and professional herpetologists as well there is no more impressive animal than Glyptemys insculpta. Adult Wood turtles reach 8 inches (20 cm) in length, their body color may range from brick red to bright yellow and they possess an attractively blotched plastron. It is not their beauty that makes them interesting however; it is their puppy-like nature and personality that set them apart from nearly all other turtle species. Breeders are having great success with this species and it is now possible to purchase these semi -aquatic turtles from captive born stock. If coming upon a wood turtle in the wild do NOT remove it. They are protected wherever found and are very highly threatened in their natural habitats. This care sheet will deal primarily with hatchling care, as that is the most critical stage of their lives as well as the age that they are most likely to be purchased. HOUSING HATCHLING WOOD TURTLES INDOORS – Hatchling Wood turtles are almost totally aquatic, leaving the water only to bask. As they age they become progressively more terrestrial till as adults they spend extended periods of time out of the water foraging. The most useful form of indoor accommodation for hatchling Glyptemys insculpta consists of a shallow aquarium or plastic sweaterbox. Hatchling Wood turtles are not tremendously good swimmers, I would suggest a water depth of 2 inches (5 cm) or less to allow them to “stand” on the bottom and reach the surface to breathe without difficulty. If this type of arrangement is used an area should be built up in one end of the habitat to provide a dry basking area. In this arrangement, because of the shallowness of the water, filtration is difficult and uneaten food can be missed and rapidly foul the water. As an alternative to this what I use is an undecorated “slant tank”. A sweaterbox measuring about 24 inches by 16 inches (60 cm by 40 cm) is propped up on one end to provide a slanted bottom resulting in a water depth at the lowest end of 2 inches (5 cm) and a dry area at the shallow end. As this is undecorated it is easily cleaned on a frequent basis. The addition of live or plastic water plants add to the sense of security for the animals and in the case of live plants provide an additional food source. As the animal grows the size of this habitat and depth of water should be increased. At 4 inches (10 cm) or so the Wood turtle can be moved out of this arrangement and into a semi-terrestrial habitat. Water quality is very important. Because of the shallowness of the water in a “slant tank” filtration may not be practical. In this event frequent water changes is the rule. Over the dry end of the environment a hardware store reflector clip light lamp should be positioned to provide artificial basking facilities. This should be positioned to provide a basking spot of 90 degrees F or so (32 degrees C) in that section of the habitat. The habitat should also be equipped with a full spectrum fluorescent light to provide for UVB. A UVB source is necessary for Vitamin D3 syntheses (needed in calcium metabolism). If preferred to this lighting arrangement a Mercury vapor bulb may be used that fulfills all requirements. DIET. Wood turtles rapidly become tame and will beg for food whenever you come near their habitat, be careful not to overfeed them. I recommend only feeding once every day or every other day for the rapidly growing hatchlings. Wood turtle hatchlings are very carnivorous and will eagerly consume insects and worms but will also consume some fruits and greens. Any aquatic vegetation such as duckweed will also be appreciated. Many of the commercially prepared turtle diets as well as Koi or Catfish foods that exist on the market today are excellent hatchling Wood turtle food. Additional calcium supplementation is essential. Powdered calcium can be sprinkled all foods. It is suggested that one use calcium supplemented with vitamin D3 if the animal is being maintained indoors and calcium without D3 if it is outdoors. Provision of a cuttlefish bone, which can be gnawed if desired, is also recommended. OUTDOOR HOUSING – Once your turtle is over 4 inches (10 cm) in size predator proof outdoor habitats offer many advantages over indoor accommodations and should seriously be considered as an option. A child’s wading pool sunk into the ground in a secure enclosure makes for a serviceable outdoor habitat. Larger ponds with advanced filtration can be used to provide a spectacular outdoor home for your Wood turtles. VERY IMPORTANT: If housing adult Wood turtles in a wetland / pond environment the pond MUST have gently sloping sides. Male wood turtles are quite aggressive while breeding and may drown females if they cannot easily escape the attentions of the male or move to shallow water. If the turtle displays signs of illness please get it to a vet. It should be noted that dosage information available on the Internet or in hobbyist books is often dated and potentially dangerous, please leave drug advice to trained professionals. This species hibernates in nature. After careful research of methods used to safely do this, hibernation facilities may be provided for the turtle. It should be noted that turtle and tortoise care research is ongoing. As new information becomes available we share this on the World Chelonian Trust web site at www.chelonia.org. Serious keepers find it to be a benefit to have the support of others who keep these species. Care is discussed in our free online email community, which may be joined from the web address above. Please contact us about the many benefits of becoming a member of the World Chelonian Trust.